This is a strictly regulated industry, with only a few operators having been granted a license to engage in this activity. The trip to the diving grounds at Dyer Island is only six nautical miles from the launch site at Kleinbaai near Gansbaai. (see map). Once the boat is anchored, the "chumming" commences with a liquid mix of fish ingredients; designed to attract but not to feed the sharks. Great care is taken not to interfere too much with the natural behaviour patterns of the great white shark and the feeding of sharks is strictly prohibited, to prevent them from associating boats with an easy meal. 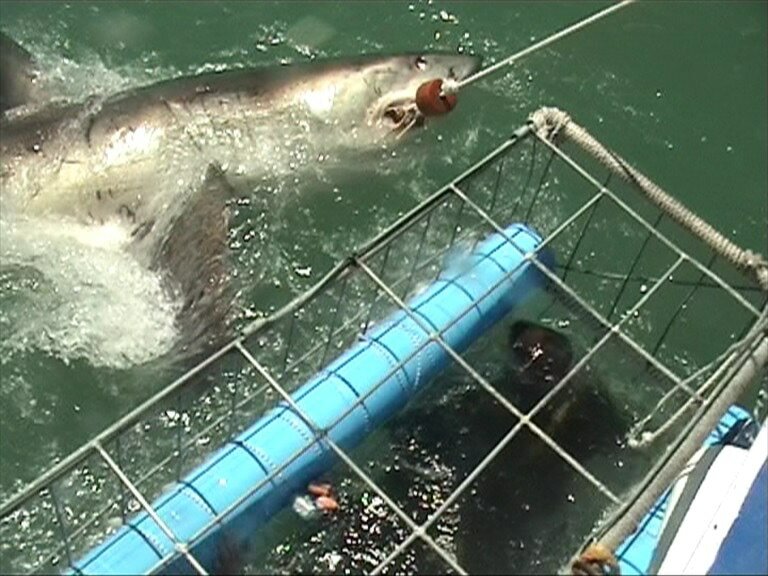 Just as soon as there are fairly active sharks in the area, the cage is lowered into the water. The cage floats on the surface and is moored right next to the boat, to make the diving and diver-exchange comfortable and safe. No diving experience is required, as sharks can be viewed from within the cage on breath-hold. The duration of the dive depends mainly on the level of shark activity and the temperature of the water, but usually it is 3 hours to 5 hours long and depends upon how playful the sharks are. All passengers will be given the chance to dive, providing the water and weather remain favourable. The visibility around the stormy Cape is seldom that of a tropical paradise and diving is sometimes significantly impaired by murky water. However, throughout the 4-5 hour trip passengers can enjoy the various vantage points from deck or from the viewing platform to observe and photograph the great white sharks only a few feet away. Surface viewing here is as great and exciting as the dive itself. During the winter months (April to October) operations mostly take place at Dyer and Geyser Islands, in and around “Shark Alley”, as this is where the sharks come to feed on primarily seals. The islands also provide some shelter from the rough winter seas. During summer (November to March) the location shifts closer to the beach, where it appears that sharks go to mate and give birth. This time is regarded as the “low-season”, as great white sharks are clearly less interested in feeding and are seldom are as numerous and active as during winter. 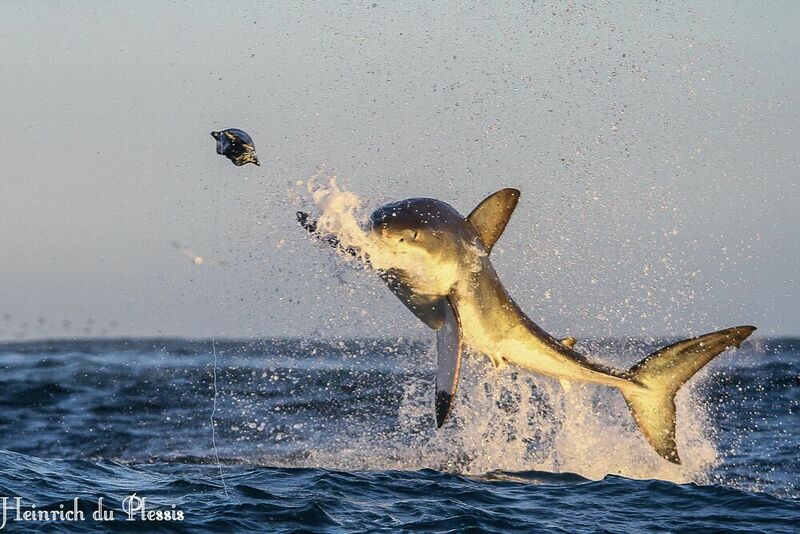 The fabulous images of great white sharks in mid-air have made the "flying sharks" of False Bay quite famous. Typical for the deep-water hunting behaviour around Seal Island, great white sharks patrol along the ocean floor, waiting to ambush any unwary seal at the surface. Often times the momentum of the vertical, upward attack sees the shark clearing the water’s surface by several feet. Much like the more commercial "Dyer Island" shark trips, False Bay offers a healthy population of great white sharks, that can be observed at close quarters on a daily basis. More protected from the elements and surrounded by the spectacular Cape mountains, this setting is truly amazing. "Seal Island" is home to a huge colony of Cape fur seals and like the one on "Dyer Island" constitutes a substantial part of the white sharks' diet. It is here that we can be witness to natural predation much better than anywhere else, and due to the particular combination of the oceanic geography and the sharks' hunting technique, they can be enticed to breach by towing a rubber seal decoy. The cage diving and "chumming" or baiting of sharks only commences after these ancient interactions between predator and prey have been observed, which adds a whole different dimension to the experience. By their very nature these trips are dependent on fairly favourable sea and weather conditions. It is therefore a good idea to set aside an extra day or two, to be able to postpone. For those with a propensity to seasickness, we suggest the prophylactic use of a "Stugeron" or similar motion-sickness tablet, at least an hour before departure. 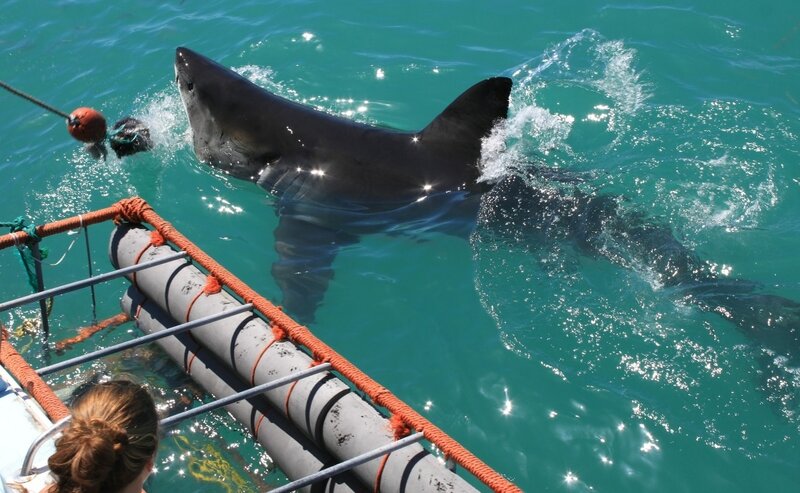 Any speculation that shark cage diving has contributed to an increased shark attack statistic over the past decade, is adamantly denied by an independent research team which monitors and records white shark behaviour here.